When NADH2 and FADH2 are produced in the Krebs cycle or in glycolysis are oxidized, ATP is produced. The electrons are transferred via several intermediate compounds before water is made. These electron carriers constitute electron transport system or respiratory chain. Cytochromes, four of the b type and two of the c type; quinones especially ubiquinone. Flavoproteins, either flavin adenine nucleotide (FAD) or flavin mononucleotide (FMN). Few other electron carriers not yet identified. There are several thousand transport systems in each mitochondrion. Each carrier of the system usually accepts electrons only from the previous carrier. The individual electron transport proteins are organized into a series of four multiprotein complexes, complex I to IV. The cytochrome and Fe-S proteins can receive or transfer one electron at a time. Ubiquinone receives and transfers two electrons and two H+ and the same is true for flavoproteins. This property of ubiquinone and flavoproteins is important in establishing a pH gradient from the matrix (pH about 8.5) to the outside of the inner mitochondrial membrane (PH near 7), because this pH gradient drives formation of ATP from ADP and Pi according to Mitchell chemiosmotic theory. Three ATP molecules are produced when each NADH2 is oxidized to NAD+ two ATP molecules are formed from each FADH2 molecule oxidized. The pathway begins with NADH2 formed in the matrix by Krebs cycle enzymes (upper right). The two electrons and two H+ are passed to a FMN containing flavoprotein, which in turn passes the electrons to a Fe-S protein. The iron in the later can accept only one electron at a time and accepts no H+, therefore the two H+ are transferred into the inter-membranal space. The reduced Fe-S transfers electron to ubiquinone (UQ) which picks up 2H+ protons from the matrix and becomes reduced to UQH2. From UQH2 the electrons move one at a time to various cytochromes b, the two H+ from UQH2 are transferred outwardly into inter-membrane space. Another Fe-S protein then receives and transfers electrons to the iron in the cytochrome-c1. A pair of H+ move outward as the Fe-S protein can accept electron only and not H.
From cytochrome-c1, the electrons are received by cytochrome-c and then these are transferred to oxygen to form water. This step is catalyzed by cytochrome oxidase. This oxidase contains cytochrome-a and -a3 as inseparable components and also two copper ions that undergo reduction and transport electrons between cytochrome-a and -a3. 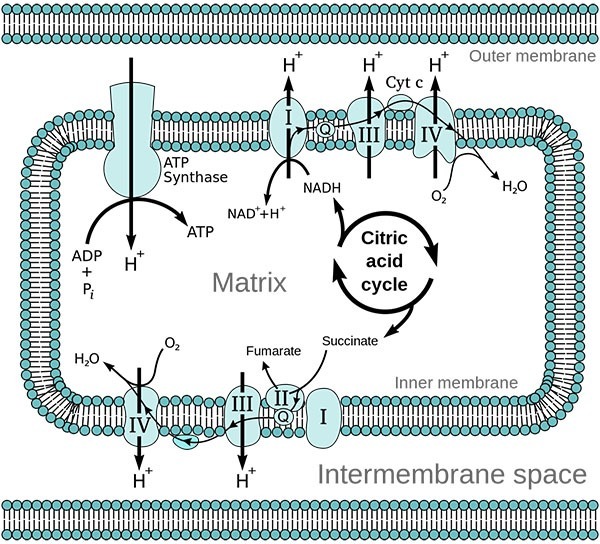 NADH2 arising from glycolysis in cytosol is accepted and oxidized by a flavoprotein (FP) containing NADH dehydrogenase present on the outer surface of the inner mitochondrial membrane.